National events like the Oscars and New York Fashion Week are big business, but what about local events? The stakes at local fundraisers, small concerts, and other festivities are no less important than their national counterparts. Both national and local events increasingly place emphasis on digital technology. Whether it’s live streaming performances, live tweeting speeches, or remote bidding for auctions, local events nationwide are using technology — particularly cell phones and smartphones — to enhance their events. Unfortunately, Wi-Fi and cellular networks can quickly overload during large events, essentially shutting down any effective use of digital technology and eliminating a key component of the function. That was the case at Totino-Grace High School in Fridley, Minnesota. Each year, Totino-Grace High School, a private Catholic school in the Twin-Cities area, hosts the Winter Place Gala, a fundraiser for the school’s programs and technology needs. The auction features big-ticket auction items and regularly attracts more than 800 parents, teachers, administrators, and community members. As the event evolved, organizers began adopting remote-bidding apps that allowed guests to place bids on auction items from their cell phones. At first, organizers relied on the school’s in-house Wi-Fi system, but quickly found that the system did not have the capacity for such a large event. Next, they tried bringing in a temporary Wi-Fi system, but at a cost of $20,000 per year such a significant investment wasn’t sustainable. Event organizers and school administrators called in connectivity experts from Konecta USA and asked the team to devise a permanent connectivity solution for this critical event. The Konecta team quickly realized Totino-Grace was the perfect candidate for a passive distributed antenna system (DAS) and designed a solution using the WilsonPro 70 Plus cell phone boosters. 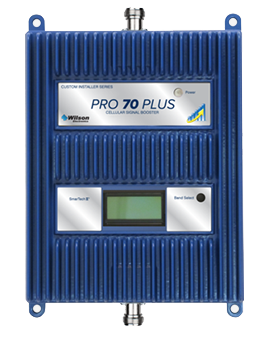 Rather than relying on Wi-Fi, a passive DAS with WilsonPro cell phone boosters would amplify the cellular signal inside the school’s gymnasium, cafeteria, and common areas. The boosted signal would allow gala guests to bid on their phones using their cellular carrier’s signal. With the system installed, Totino-Grace High School was able to provide the necessary connectivity for its event without taxing the school’s existing Wi-Fi system. Wi-Fi offers a viable connectivity solution for many buildings, but in a room full of laptops, tablets and smartphones, the network may not have sufficient bandwidth to support a reliable connection. Installing a temporary, secondary network comes at considerable costs. Alternatively, passive DAS boosts cellular signal using passive components and can be used in conjunction with Wi-Fi networks. A passive DAS solution can be installed in a matter of days, and with less overhead, fewer regulations and lighter equipment than an active DAS, a passive DAS is a financially viable option for a wide range of users. 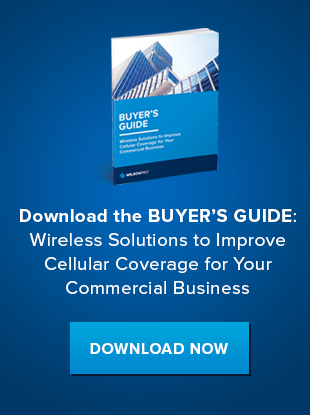 Download our Buyer’s Guide to learn more about how passive DAS compares to other connectivity options, including Wi-Fi.